Hi, I’m an architect working in India. The timber truss made is of 20ft span. The tie member is in two parts, joined at center with a half lap and held with the king post by a metal u-strap. We have given a post underneath the joinery as temporary support, but what should be done to give a permanent support without disturbing the truss and members resting over it once we remove the post from below? Can a steel c section be fixed to hold the beam from below? Pls do give suggestions with references to follow. Thank you! 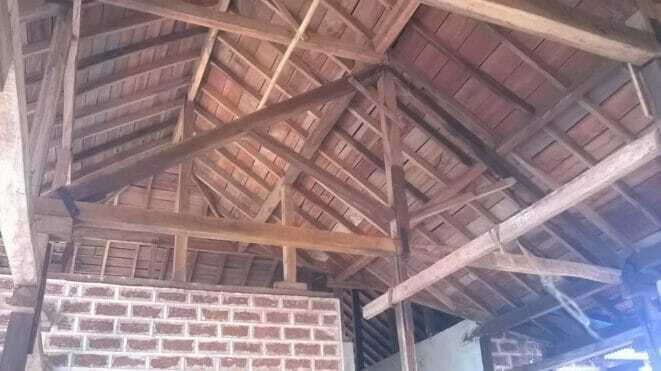 With King Post trusses, the king post (vertical member) and the bottom chord (horizontal member) are in tension with gravity loads, and thus need tension connections. We typically use shear plates, which come in 2 5/8″ or 4″ diameters, and can be through-bolted or lag-bolted. There are various strength values depending on the diameter, wood species, and loading combinations you choose to use. Reference design values can be found in Table 13.2B of the American Wood Council (AWC) National Design Specifications (NDS) 2015. Even if you add an additional support from beneath, which would help to alleviate the tension loads, I would still add a tension connection to the bottom chord. I cannot say what caliber is required without knowing more about the design loads, but hopefully this helps!